to long and lonely years. in a heart of no use. You stalk me yet and I stand. now ground as dust beneath my heel. and find the world not so hard. my strength if only by association. of what heavenly use is a soft shell crab? What Keeps Us Awake. . . . 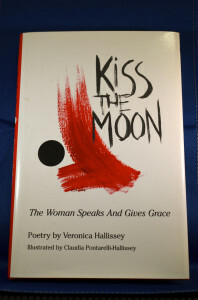 Kiss The Moon is for sale for $21.00 at this site. The shipping cost is included in the price. I look forward to hearing from you. So much feeling, Love the idea of looking inward to softer places to see the world is not so hard. Maria, your response is what makes writing and sharing so necessary to me. To have someone find meaning in what I write is the rarefied air which I breathe.